Domino’s customers can now use a virtual voice-activated assistant to order their pizzas for them. Launched today by the takeaway pizza chain, ‘DRU Assist’ can be used within the Domino’s app or online, either through text or voice-recognition technology. “DRU Assist is on hand to help our customers streamline their ordering process with efficient and helpful service with a side of personality,” said Domino’s Chief Executive Officer, Don Meij. Meij said each time a customer uses DRU Assist it will learn and improve recognition skills. 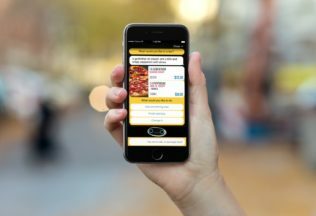 “As of this year Domino’s as a Company will move from a ‘Mobile-First’ mindset to Artificial Intelligence First technology,” Meij said. “Allowing the beta to be open to the whole nation means that DRU Assist will learn faster, and provide a better service for our customers,” he said. Domino’s said it plans to launch ‘Domino’s Anywhere’ this year, technology which will let customers tell delivers exactly where they are, so pizzas can be taken straight to a customer who might be in the middle of a park or on the beach. “We know that pizza is a social sharing meal and many of our customers want to enjoy it on a day out with the family, and not be limited to a house or office,” Meij said. Domino’s today also launched the ‘Domino’s Offers Bot’ which is integrated into the Facebook Messenger platform to offer customers pizza deals. Domino’s has been heavily investing in technology and unique delivery methods including delivering its first pizza by drone in New Zealand in 2016. At the same time, Roy Morgan Research has shown Domino’s visitation rates have significantly increased from 1.8 million customers every four weeks in 2012, to 2.3 million in 2016.